His Eminence Elder Metropolitan John (Zizioulas) of Pergamon was born in Kozani, Greece (1931). He was educated at the University of Athens and at Harvard University, also serving as a fellow at Dumbarton Oaks Center for Byzantine Studies. After receiving his doctorate from the University of Athens, he taught at the University of Edinburgh, later moving to the University of Glasgow where he was professor of systematic theology for fourteen years. He subsequently taught at King’s College (London) and the University of Thessaloniki (Greece) until his recent retirement. Elder Metropolitan John has been visiting professor at the University of Geneva and at the Gregorian University in Rome. 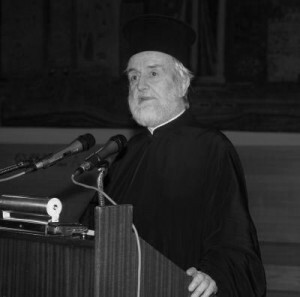 Arguably the most internationally renowned and influential Orthodox theologian, Elder Metropolitan John is also the theological spokesman for the Ecumenical Patriarchate on environmental issues, serving as Chairman of the Religion, Science and Environment Committee from its inception in 1995 to 2009. He also co-chairs the organizing committee for the Halki Summits. He is a key figure in major ecumenical discussions, formerly chairing the Orthodox/Anglican dialogue and currently chairing the international Orthodox/Roman Catholic theological dialogue. In 1993 he was elected fellow of the Athens Academy of Arts and Sciences, of which he became president in 2002. At the heart of his theology is ecclesiology resting on an ontology of the person and derived from a deep reflection on the nature of the Trinity. His publications have focused upon the twin themes of ecclesiology and theological ontology. The theology of Elder Metropolitan John reflects the influence of Russian émigré theologians such as Nikolai Afanassieff, Vladimir Lossky and his teacher Georges Florovsky. Zizioulas has also been significantly influenced by the ascetical theology of Archimandrite Sophrony (Sakharov), founder of the Stavropegic Monastery of St John the Baptist in Essex, England. In addition to numerous articles published in various languages in theological journals, he is the author of over a dozen books, including Being as Communion (1985), Eucharist, Bishop, Church (2001) and Communion and Otherness, published by T&T Clark/Continuum (2006). Two forthcoming volumes will address the significance of eschatology as well as the relationship between theology and ecology.